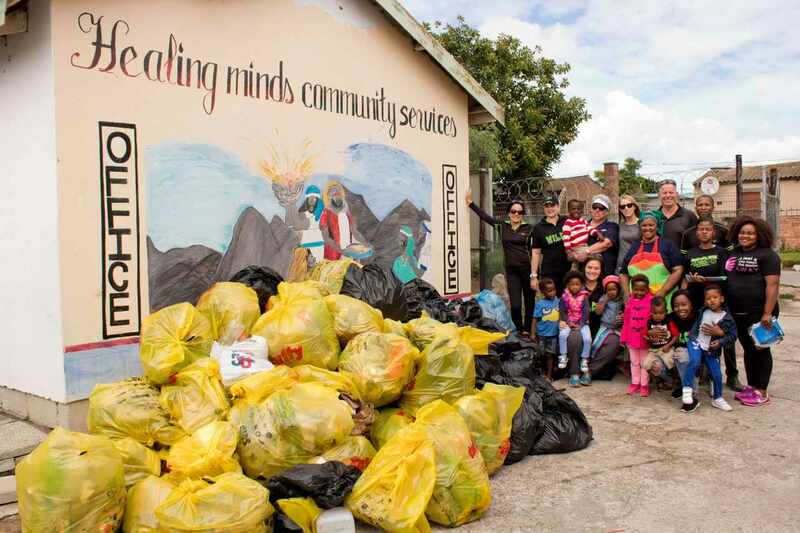 17 March 2018 – The Project NMB Clean City Task Team took to the streets to educate the public surrounding Healing Minds Community Centre in Walmer about responsible waste management. Emmy Nxayeka, Schools Project Manager of The Waste Trade Company kicked off the event with a fun yet educational talk about recycling. The task team then issued volunteers with two bags each, as well as gloves. The Clean City Task Team approached the cleanup with sustainability in mind. A two bag system was implemented in order to not only share recycling in theory, but to assist the public in the actual practice of separation at source. Blue bags, sponsored by NMBM were dedicated to recyclables, whilst black bags were for any waste that would go to landfill. Although the event started with a handful of volunteers, it ended with approximately 100. Members of the public were seen leaving the comfort of their homes in order to join the cleanup. Sonwabise Mfunzane, a 6 year old member of Healing Minds, took it on himself to grab the boombox and mic and stood on street corners calling the community to action. The spirit of the event was apparent in the community support, as well as the visible embracing of the two bag system. A total of 160 bags of waste was collected that morning, of which half was recyclable. The recyclable material was left with Healing Minds Community centre, who would further sort into the various bins provided by The Waste Trade Company. Thereafter, the product would be collected for recycling.